Hollybeary Creations : YNS August Release Sneak Peek!!! YNS August Release Sneak Peek!!! Who's ready for a new release from Your Next Stamp? It's Preview day and that means the Design Team is sharing a sneak of new products that will be available Saturday at 10pm EST. This month it's a Special Release as YNS Is celebrating it's 8th Birthday!!! 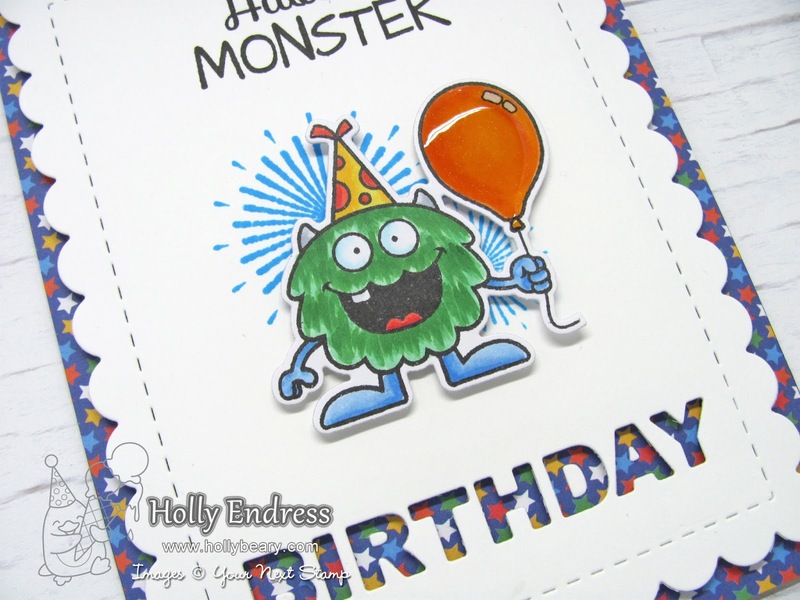 I'm showcasing the new Silly Monster Party Stamp Set and a few other new products. I created a Blue card base and then I added a piece of the new Birthday Boy 6x6 Paper. Then I die cut a piece of White cardstock using the new Scalloped Rectangle Die set and part of the new Bold Happy Birthday Word Die. I stamped the sentiment from Silly Monster Party leaving off part of it so it would read just Have a Monster. Then I stamped the new Starburst background in Blue Curacao Ink. I adhered the panel to the card front using some foam tape. 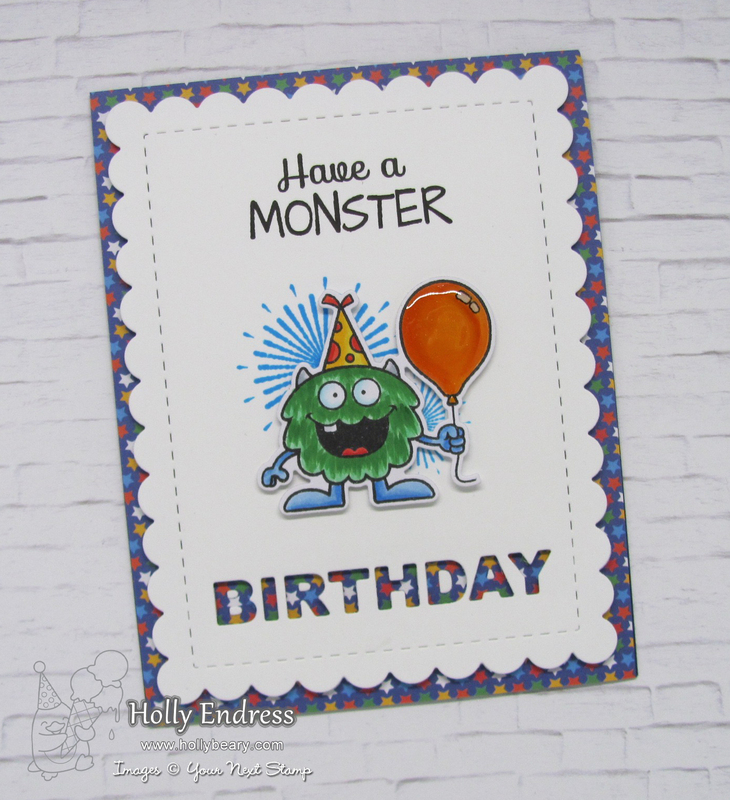 I stamped the Monster image onto some X-Press it blending card stock using Black Olive Ink and I colored it in with Copics using colors from the pattern paper. I used the coordinating dies to cut him out and I adhered him over the starburst with some foam tape. Then I added some Clear Wink of Stella to the Balloon and some Glossy Accents. Isn't this set adorable? Head over to the YNS Blog and see what the rest of the Design Team has to share and be sure to join us tomorrow for our August Birthday Release Blog Hop at 10pm EST, You don't want to miss it.. We have some Big Prizes!!! Holly, this is so adorable! Too cute Holly. I love the starbursts behind him! This is the perfect birthday card to celebrate eight years! happy birthday your Next stamp! This is so much fun Holly! That's gorgeous!!! Love everything, love how you did the birthday word! Cute. His face says it all. 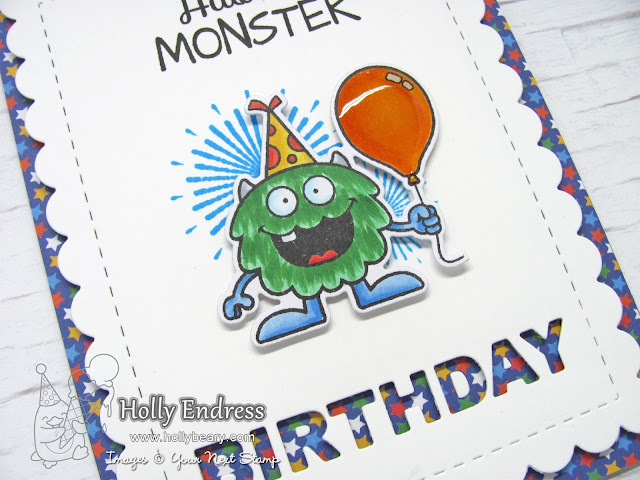 Love the monsters and the pretty birthday cut out. Awesome design, Holly. Love the pretty paper peeking through the "birthday" die cut. The balloon looks AWEmazing. Cute card. I love the frame die.